When it comes to promoting your business, there’s a lot of emphasis put on the idea of thinking big. This is a good thing: ideas and inspiration for promoting your business should never be stunted. However, when it comes to creating physical signage for promotion, sometimes thinking small in terms of the physical scale of your display units can be a fantastic idea. Why go small? There are a number of different reasons why you might want to consider smaller signage options. For one, your space may be limited, either due to physical restraints or due to zoning laws or community rules. Second, sometimes a well placed smaller sign can create intrigue and interest in the appropriate setting, allowing a potential customer to interact on a more intimate level with your company. Whether it’s for personal or logistical reasons, small signs can prove an asset to your company. These six effective small sign styles give you a lot of bang for your buck. Like technology, advertising has gone mobile in recent years. It’s an exciting time, with new and creative innovations hitting the market on a frequent basis. A backpack flag offers a compact advertising solution which can take your brand message wherever you go-literally. Available in two different styles, the Backpack Flex Blade® and Flex Banner™, these lightweight flags emerge from an easy-to-carry backpack container with comfortable and durable straps. The flag itself can is printed with UV-resistant, vibrant ink, and can be printed with your chosen graphics on either one side or two sides. Whether walked around on the street, at a festival, or in a trade fair, this small advertising unit can deliver wide-reaching results: not only can you cover a lot of literal ground, but it’s an interesting and intriguing ad that is bound to garner interest from passers-by. Our Flex Blade® Flags are a popular and effective method of outdoor advertising. 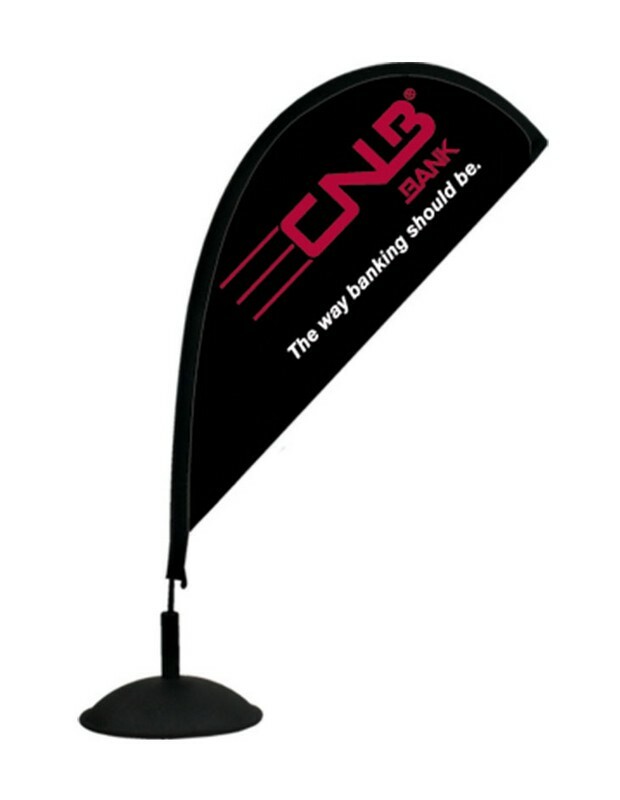 The Mini Flex Blade® Flag allows you to bring the same effective and vibrant advertising message to a small setting, be it a limited-space set-up at an outdoor fair, or an indoor setting such as a retail store. Full color printing and perfect finishing on a strong metal base and pole structure ensures that the flag won’t fold or hang in a lackluster, drooping fashion. Highly customizable, these flags can be printed with the graphics of your choosing, with single or double-sided printing available. The compact scale of these flags (about 14 inches in total) makes them easy to transport and display at trade shows, but they’re equally effective when displayed on counter or shelf spaces, at the point of purchase, or even in a restaurant/cafe setting. Retractable banners and stands are some of the most universally used signs for all types of business, and with good reason. 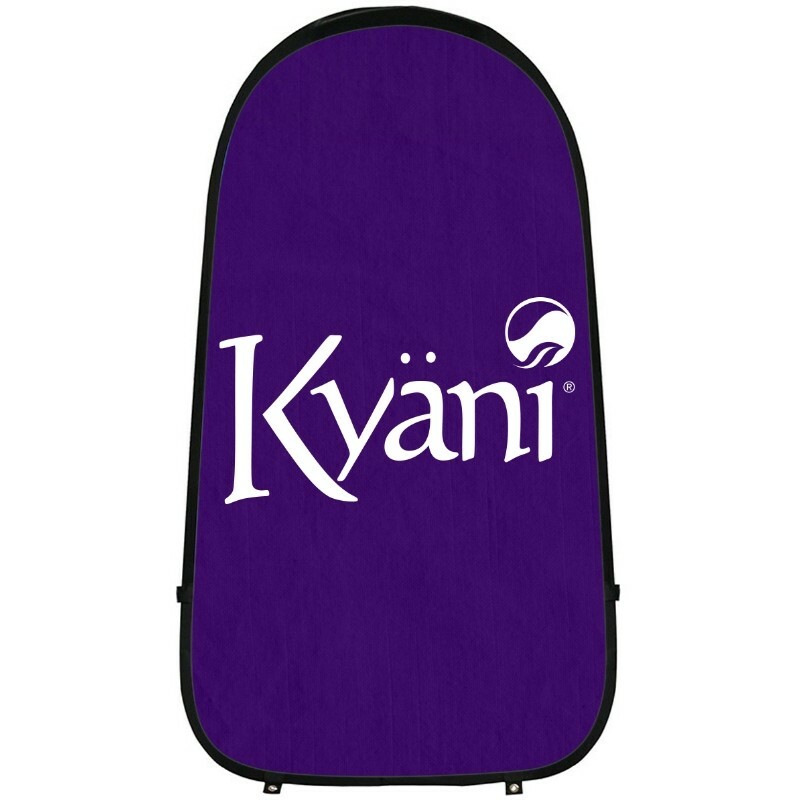 They are sturdy, versatile, and offer the perfect canvas to broadcast your branding. But bigger doesn’t always have to be better. Sometimes, a mini retractable banner stand is just the ticket for advertising on the fly. This mini banner features a print size of 11.69 inches wide by 15.5 inches tall, and stands on a 13-inch wide base. The banner stand rolls up and coils into the base, making for an easily portable and lightweight display unit which can easily go wherever your business takes you. If you need to frequently set-up and take down your ad, or want it to be part of meeting presentations or small booth setups in trade shows, this small banner can be an effective, time efficient, and easily transportable option. 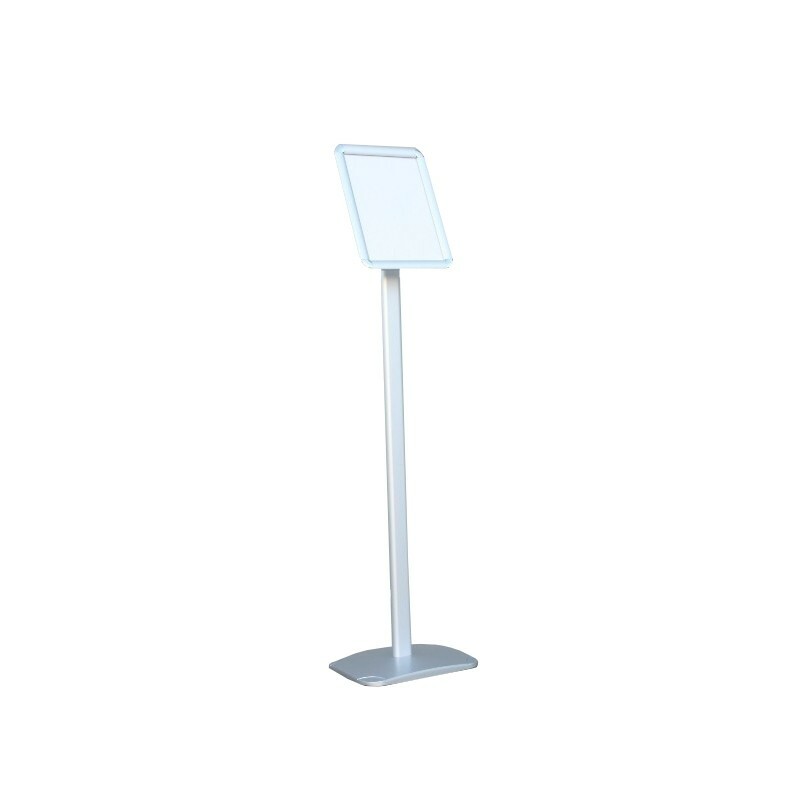 When space is at a premium, an adaptable and highly visible sign like the literature stand with snap frame (pictured at the top of the post) can provide the perfect solution. Available in a number of different sizes, you can choose to use this frame to make a slightly bigger or smaller footprint in your display area. With an overall slim profile and sleek design, it doesn’t need to be huge to garner a big impact with people passing by. It sends a clear message that your offerings are on show as people walk by, giving them a low-stress chance to look at your menu or list of services to consider them before walking in. This is the perfect way to target potential sales and entice customers. These units are appropriate for indoor or outdoor use, and can be customized even further with product or brochure displays. When it comes to promotion, attention is the name of the game. So why not command attention with a game? In spite of its relatively small size (24"W x 34.375"H x 21.75”D) which makes it easy to display on a table top, our Plinko Game is an attention grabber of the highest order. Everyone loves to try their hand at games like this, which is why it’s the perfect promotional tool. As people walk up to check out and try the game, it makes them happy. When people are happy, they are far more receptive to hearing your business pitch; in that way, the game is the perfect ice breaker. The center plate can be changed from event to event, so you can personalize your game to advertise your company in general or a specific release or event. If you love the impact that billboards have but couldn’t hope for that amount of space at the events at which you are showing, consider the Vertical Flexi-Billboard. It has all of the convenience of an A-Frame banner, allowing you to create highly visible messaging. It’s incredibly easy to assemble and transport, and is appropriate for both indoor and outdoor use. It comes with four metal ground spikes to ensure a stable presentation. Put up your own small billboard at your next event, be it a sporting event, outdoor festival, parking lot promotion, or around the corner from your place of business as a directional, and watch how quickly people notice you. Conclusion: Just as there is a time and a place for large scale signage, there are settings and situations where small signage is the right decision. These six creative and effective small sign styles represent just a small example of the many highly customizable options available in the Above All Advertising collection. Have you ever used small scale signage in your advertising?